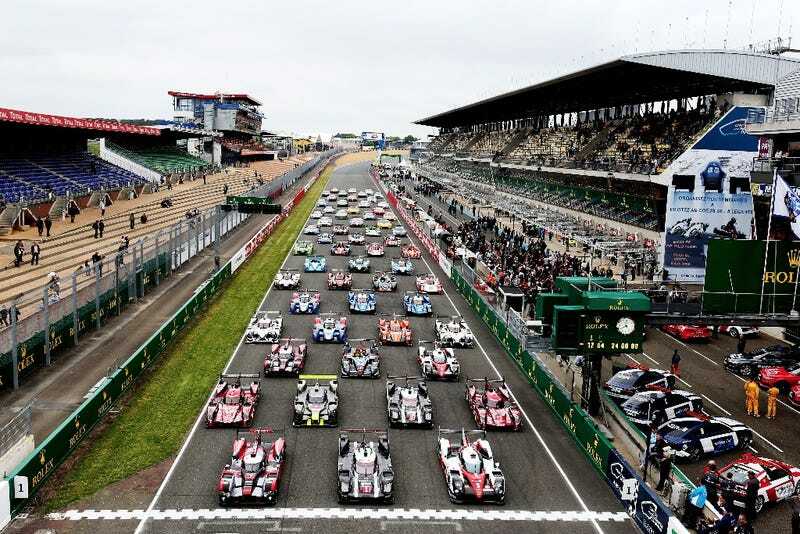 Here is your 60-car grid for the 2016 24 Hours of Le Mans. The big test day before the 84th running of the race kicked off Sunday, giving teams a chance to shake down their cars on the full 8.47-mile Circuit de la Sarthe before the race in two weeks. The test day has become mandatory this year due to the jump from 56 teams to 60, per Crash.net. Today, the WEC notes that the No. 8 Audi R18 set the fastest time of the morning session with a 3:21.375, followed by the No. 1 Porsche 919 and the No. 2 Porsche 919, and with Toyota not far behind. Of course, because it is a test day, teams are finding out what’s wrong ahead of the race, and some cars, such as the two LMGTE Pro-class AF Corse Ferrari 488s, are spending lots of time in the garage accordingly. It’s always hard to tell who will really be the fastest during for qualifying and the race based on testing data, but it’s always fun to guess anyway. The 24 Hours of Le Mans website has been putting detailed notes on every practice session here, for the curious. There’s something about the big group photo of the cars that just does it for me every year, though. The front is manned by ground-bound spaceships as the field eases into cars that look a bit more normal at the back. You can find the full entry list for this year’s race here, and information on how to join Jalopnik to watch the whole thing here.